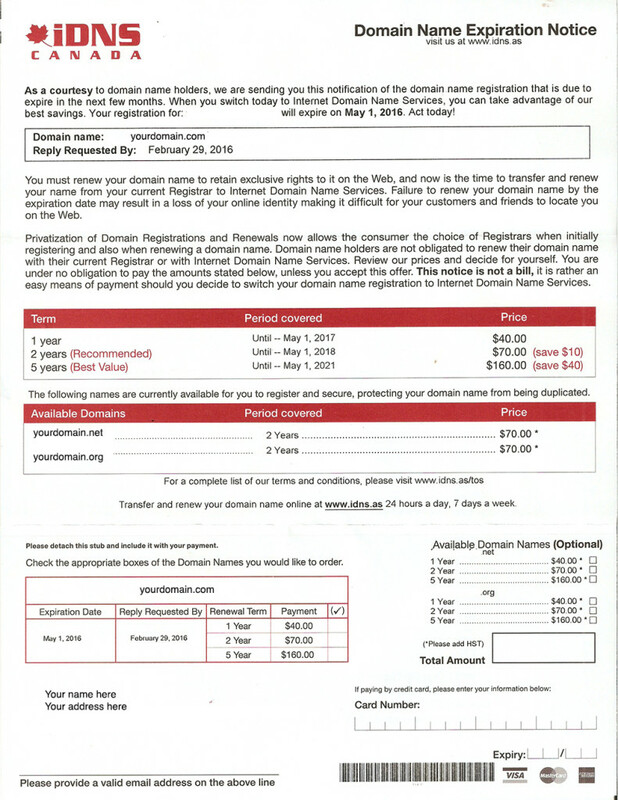 Further down in the letter it does state in bold “This notice is not a bill, it is rather an easy means of payment should you decide to switch your domain name registration…”. This company is a little more straightforward with what their intention is… to take your domain name from your current host. Some letters sound much more vague so you aren’t quite sure if it is a real renewal form or not. I have received many calls and emails from clients of mine who tell me they have received such a letter and I just tell them to ignore it. So if you don’t recognize the name of the company sending you a Domain Name Expiration Notice, then it probably isn’t yours. Call your web developer first and check with them. Chances are it isn’t your hosting provider. * Your provider will most likely send you emails a month in advance reminding you to renew.